I wasn’t able to get to Portland for this year’s PDXBot event as we had previous plans to be up to the Okanagan region that same weekend. But my friend Dave Hylands offered to take a couple of my robots with him and run them for me. So I packed up The Thin Man and AL the microsumo, gave Dave a few instructions and advice about behaviors and such. I was very happy with the results: The Thin Man placed first in the Advanced Minisumo category. Dave’s cool minisumo Stinger placed second, and Daryl Sandberg’s Slik placed third. AL placed third in the Microsumo category. You can see the full results here and here. Dave was gracious enough to provide some video footage from the event. I picked out two of the battles between two of Dave’s robots and The Thin Man for your viewing pleasure (each is 2.7 MB). Both videos are a lot of fun to watch and highlight that winning is sometimes just a bit of luck. In both videos it is very clear that The Thin Man is good at tossing an opponent out of the ring but detecting the opponent is a bit of hit-or-miss. I really think both matches could have easily turned out quite differently. But I’m not one to complain at this point. The Western Canadian Robotics Society held their annual event this past weekend, and I was fortunate enough to have the opportunity to attend again. This year the event was held at the Aero Space Museum out near the Calgary airport. Once again, it was a great event! I captured a number of photos and short video clips (not always the best quality, sorry) here. I haven’t had a chance to clean them up or even give them proper titles and descriptions yet, but maybe you’ll enjoy them anyways. In addition to the minisumo events there were the classic events of line following and mine sweeper. There was also a nice First Lego League demonstration. Since I was flying and had to bring my robots on the plane, I only took my two minisumos: Velox and The Thin Man. As you could imagine, I had to put them in my suitcase, there was no way I would be allowed on the flight with something that is basically a sharp chunk of metal. There were eight minisumos competing in the “advanced” class this year. It took six rounds to declare The Thin Man the first place winner, while Velox took third place. Craig Limber’s Sayonar Sucker had an excellent day and earned second place. 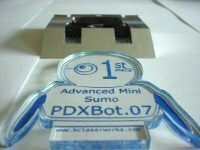 It helped that Dave Hylands wasn’t attending this year, he is going to PDXBot.07 this coming weekend instead. It was a lot of fun again this year and you can be certain I’ll plan to go again next year.